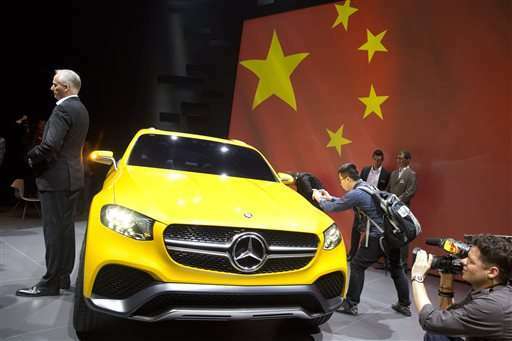 A Chinese regulator said Thursday it has fined Mercedes Benz 350 million yuan ($57 million) on price-fixing charges in a wide-ranging probe of the auto industry that has prompted complaints foreign automakers are being treated unfairly. The unit of Germany's Daimler AG was fined for violating anti-monopoly law by enforcing minimum prices dealers were required to charge for vehicles and replacement parts, according to the price bureau of the eastern province of Jiangsu. Setting minimum retail prices is common in other countries but Chinese regulators reject it as a violation of free market competition. Regulators have targeted automakers, technology suppliers and dairies in a series of anti-monopoly investigations over the past two years in an apparent effort to force down prices. Business groups say the secretive and abrupt way the investigations are conducted is alienating foreign companies. The U.S. Chamber of Commerce said last year that Beijing might be violating its free-trade commitments. The ruling Communist Party under President Xi Jinping has promised to make China's economy more productive by opening more industries to private and foreign competition. But at the same time Beijing is trying to create "national champions" in fields from autos to telecoms to aerospace. Business groups say that has led regulators to use the anti-monopoly law and other regulations to shield domestic companies from competition. Regulators deny foreign companies are treated unfairly. In February, U.S. chipmaker Qualcomm Inc. was fined 6 billion yuan ($975 million) on charges it abused its dominance in wireless technology to charge "unfairly high" licensing fees. China is the world's biggest producer of mobile phones and other wireless devices, and Beijing has complained about the high cost of technology licenses. In the auto industry, companies including Audi, Chrysler and a group of Japanese auto parts makers also have been fined. Business groups welcomed the enactment of China's anti-monopoly law in 2008 as a step toward clarifying operating conditions. Since then, they have said it is enforced more actively against foreign companies than local rivals. Industry analysts say the auto investigation might have been prompted by complaints automakers abuse their control over supplies of replacement components to charge excessive prices. 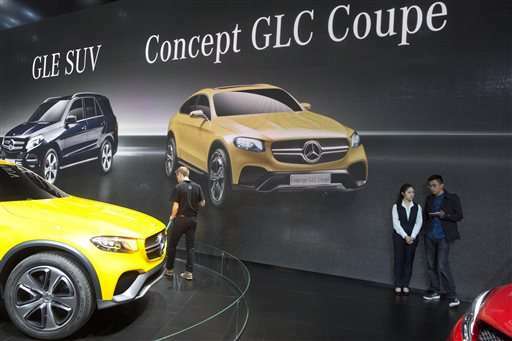 The official Xinhua News Agency reported in August that regulators concluded Mercedes was guilty of "vertical price-fixing," the official term for enforcing minimum retail prices. Thursday's announcement gave no explanation for the eight-month delay in imposing a penalty following that statement. An official quoted by Xinhua in September said prices charged by Mercedes for replacement parts were so high that purchasing the parts used to make one C-class car would cost the equivalent of 12 vehicles. Mercedes and Audi responded to the investigation last year by cutting prices for parts such as windshields by up to 38 percent. Chrysler, a unit of Fiat Chrysler Automobiles NV, cut prices of imported Chrysler, Jeep and Dodge vehicles.